If you’re sick and tired of coming out in the morning to shovel snow off your driveway while you’re cursing and shivering, maybe it’s time to invest in a snow blower. Also known as snow throwers and snow blasters, you can inject a bit of fun into your morning routine and get the job done in a fraction the time. We’ll kick off with a selection of snow blower reviews then we’ll give you the lowdown on getting the best model the easy way. First up in our snow blower reviews is a super-quiet and compact 18-inch from WEN coming in at an incredibly keen price-point. While this blower weighs just 30 pound and comes with 6-inch never-go-flat wheels so you can maneuver it anywhere, you’ll get decidedly heavyweight performance. You’ll be able to carve a path 18 x 8 inches through snow which you’ll then be able to throw a full 20 feet in the direction of your choosing. You can adjust the chute through 180 degrees so you’ll get ample mobility. If you deal with lots of wet snow, you might want to reconsider since the WEN doesn’t enjoy this consistency and the funnel might clog on a regular basis. For a quiet, dependable and versatile snow blower from a brand you can rely on, the WEN 18-incher is unbeatable while the price is almost unbelievable. 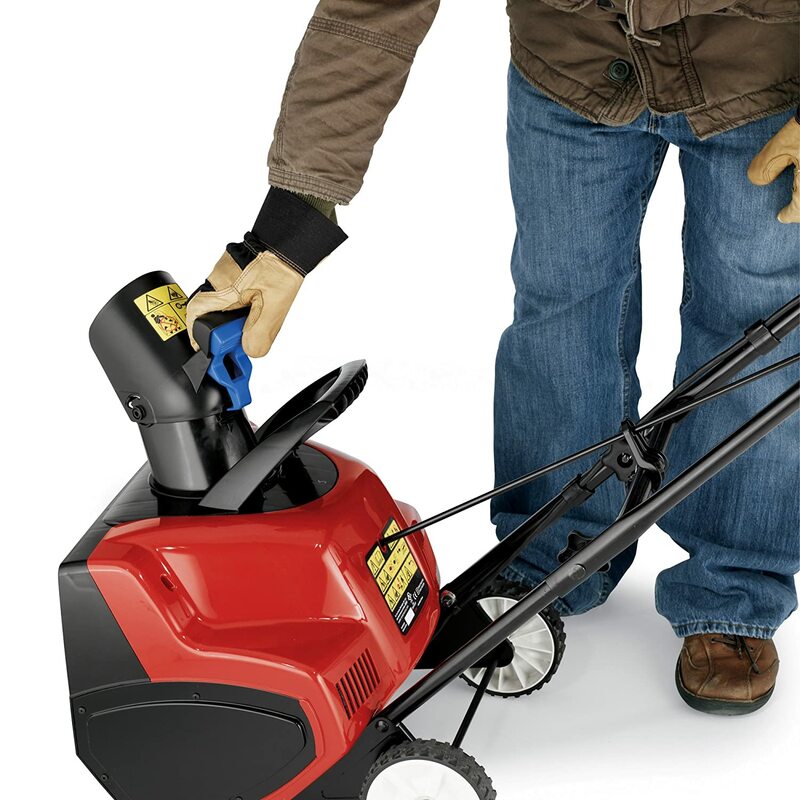 Next up in our snow blower reviews is another robust electrical model, this time from Toro. Proprietary Power Curve technology gives you a deeper and smoother clean even when the snow is thick and heavy. Clearance is generous at 18 inches and you’ll be able to clear snow down to a full 12 inches giving you better performance than most snow blowers in this class. If the 18-inch model isn’t to your taste, the Toro also comes in smaller 12-inch and 15-inch guises if you’ve got a smaller area to clear and don’t want to risk overkill. The zip deflector offers you the option of throwing the snow high, low, and in-between so you’ve got plenty of flexibility. 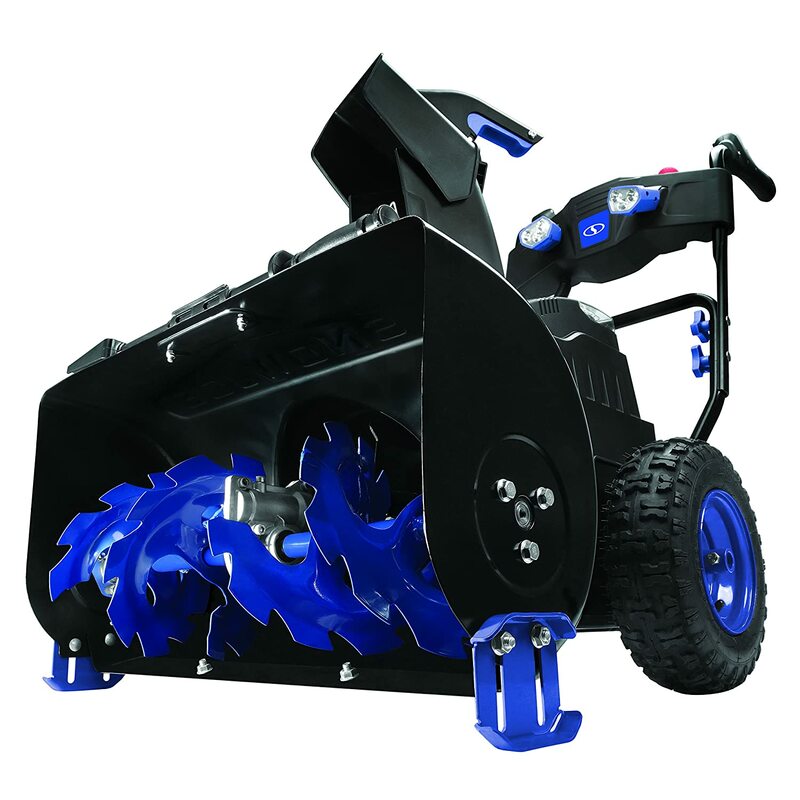 Even though you’ll get all the firepower you need to shift serious amounts of snow, this blower weighs a scant 25 pounds and it’s highly maneuverable. As the name hints, Snow Joe dominates this vertical. Next up in our snow blower reviews is the first of a pair of models from this industry giant. 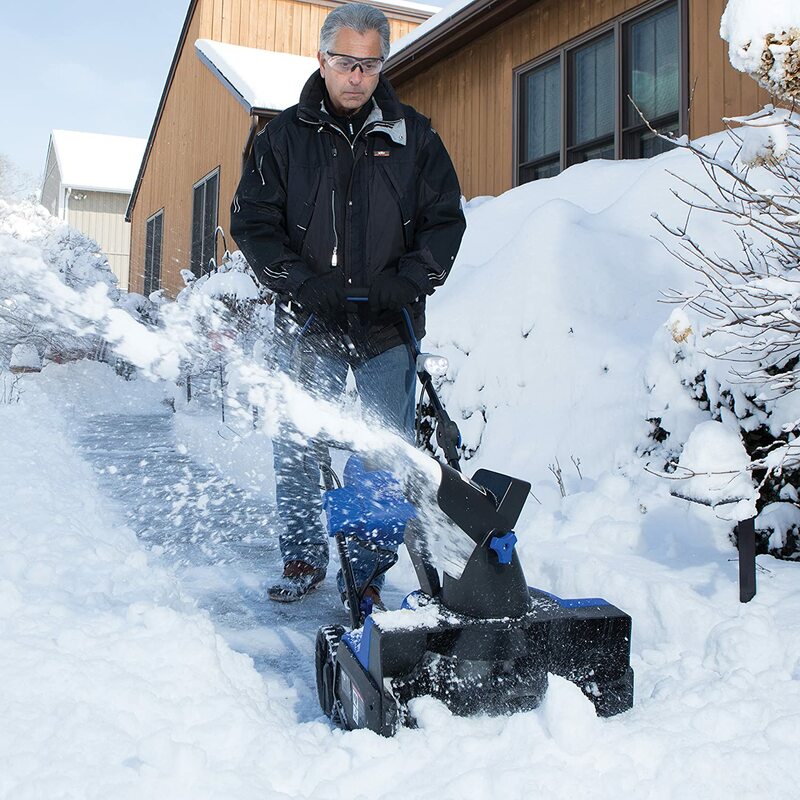 You’ll get all the cordless convenience of a rechargeable blower along with a powerful 500-watt brushless motor so you can make light work of even large flurries of snow stopping you from accessing your driveway. You’ll be able to move almost 500 pounds of snow a minute and the other stats are in line with 18-inch blowers allowing you to cut up to 8 inches down and blast the snow 20 feet in the direction of your choosing. 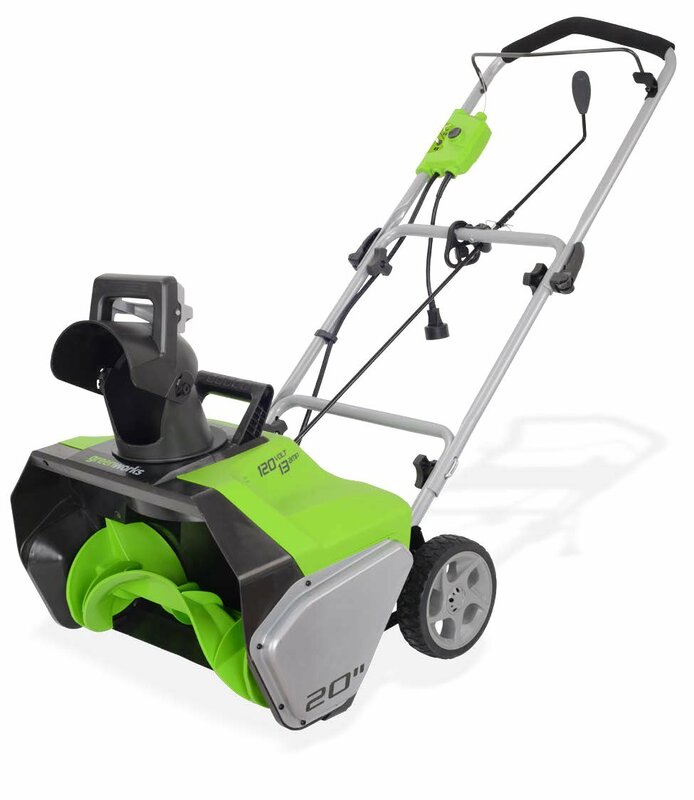 As we near the end of our snow blower reviews, we’ve got a pocket-friendly corded blower from Greenworks, a brand with a hard-won reputation for producing rock-solid garden equipment at bargain basement prices. If you’re happier with corded appliances and you want a powerful blower enabling you to cut snow 20 inches wide and up to 10 inches deep, you’re in safe hands. While you might not get the convenience and maneuverability of a cordless, in return you’ll get all that oomph and unlimited run time into the bargain. 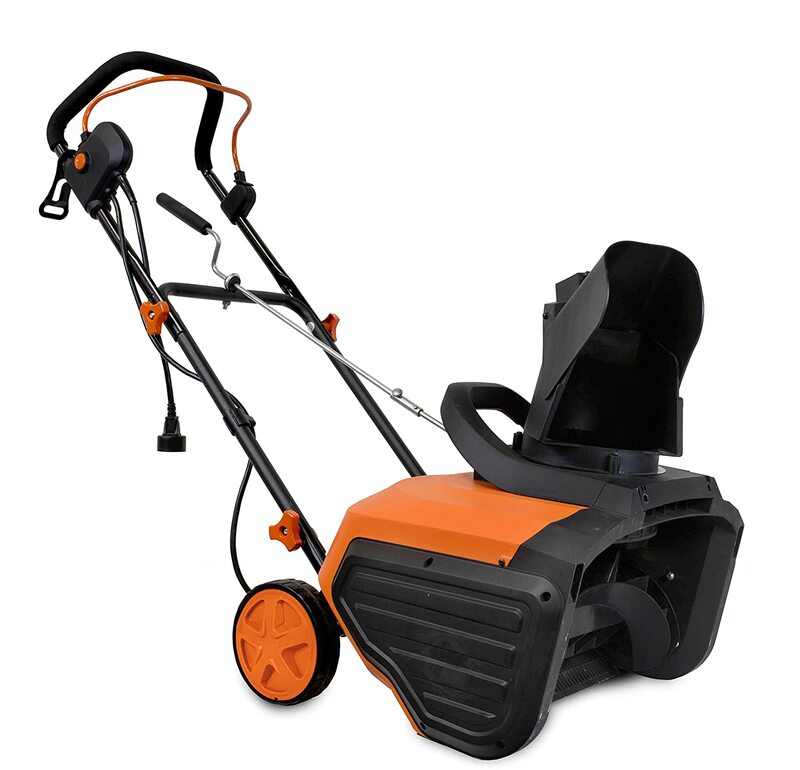 Despite such raw power, this blower is small and compact enough to use in limited spaces without straining yourself. 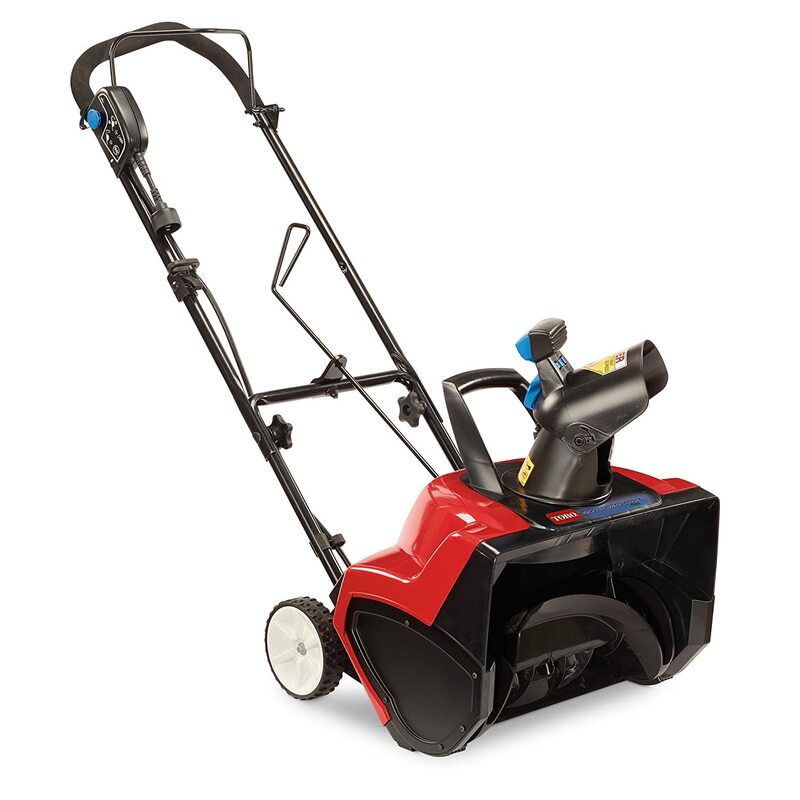 From the push-button start through to the quiet operation and LED light if you opt for that model, this snow blower is a dream to use and priced to sell out in large numbers. 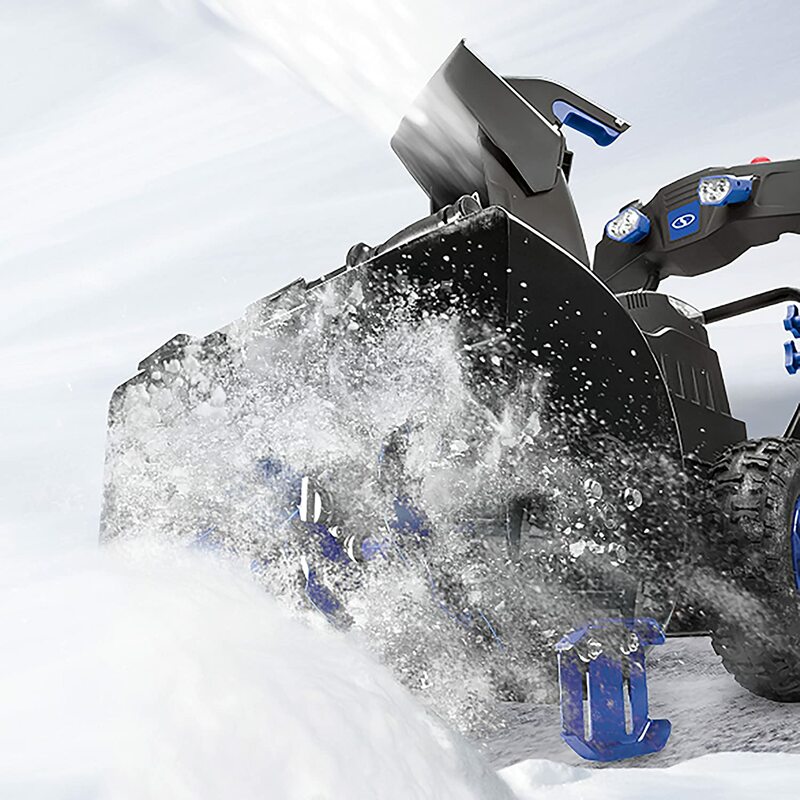 If you’re looking for the best snow blower on the market and you’ve got the money to spare, this 24-inch black and blue beast from the legendary Snow Joe is unassailable. If you’re looking for the cheapest snow blower, this is not for you. If, on the other hand, you need to displace large volumes of snow in a hurry on a regular investment, this blower might be the best investment you make all year. Build quality is first-rate and the precision-engineered componentry is built to stay the distance while delivering a top-notch experience. 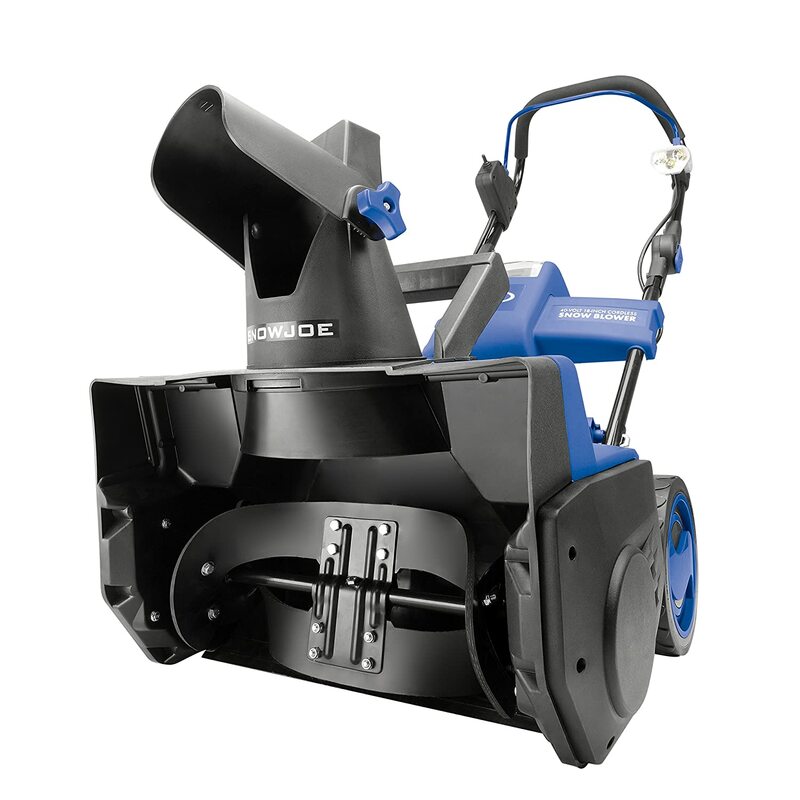 If you want to take all the sting out of shoveling or moving snow from your driveway every day through winter, give some serious though to this 24-inch gem from Snow Joe. 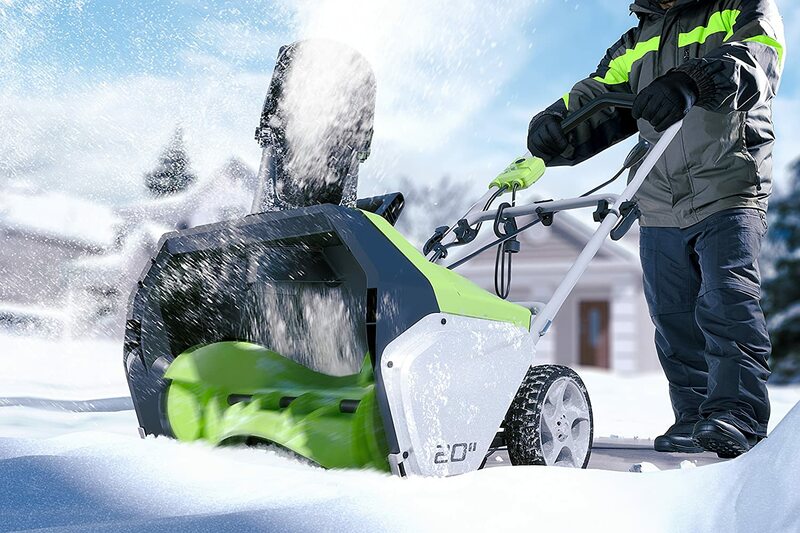 With our snow blower reviews wrapped, we’ll round out with some simple pointers on snow blowers and why you should consider adding one of these awesome machines to your cold-weather arsenal. Single-Stage, 2-Stage, or 3-Stage Snow Blower? Don’t be confused by the terminology here, the difference in blowers is pretty basic, really. Self-evidently, snow blowers with bigger clearance widths will clear a given area with fewer passes saving you even more time. Think about the type of areas you’ll need to be clearing and make sure the snow blowers you’re checking out come with adequate clearance width to save you going constantly back and forth. The intake height contributes to both performance and your overall user experience with the blower. This measurement determines how deep you can allow snow to get before successfully clearing it. There’s no magic number here so think about average snow depth in your area and buy accordingly. 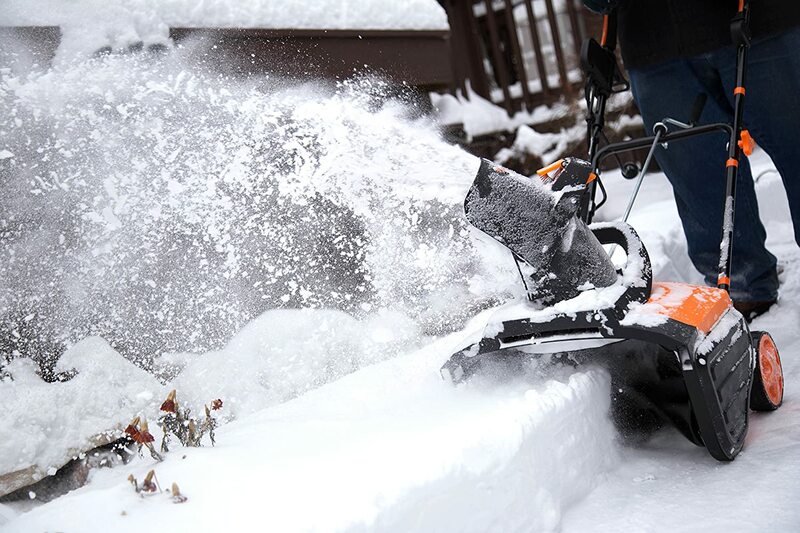 Most regular snow blower will fire the snow away anywhere from 10 feet to 20 feet. This is ideal for normal driveways. You’ll need to ramp things up to a more powerful 2-stage snow blower if you need to fire snow 30 feet or more. Hopefully, you’ve got a sound idea of which snow blower would work best for your needs and you can see that buying one needn’t be as expensive as you might have imagined. Get in touch any time if you’ve got any queries or feedback at all. We’re continuing to build out this site to cover every conceivable aspect of the home and garden. If there’s anything you’d particularly like us to cover, just let us know.